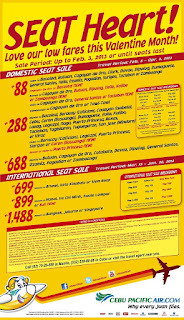 Cebu Pacific Seat Sale - SEAT Heart! Cebu Pacific has once again announced another seat sale this Valentines month to selected domestic and international destinations. 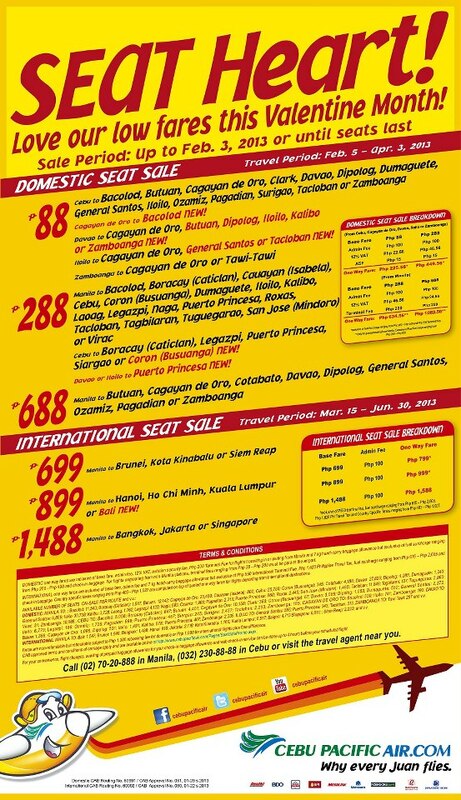 For as low as P88, you can travel to selected domestic destinations. More seat sale destinations are offered so better check out their website for further details (or click me). Seat sale is available up to February 03, 2013 or until seats last. Travel date is from February 05, 2013 to April 03, 2013. Terms and condition apply so make sure to read before hitting on that purchase button!